Scale models or model kits are produced by the millions and give hours of pleasure to hobbyists. They're sold in specialized hobby and craft stores as well as toy, department, and drug stores—even supermarkets may carry them. "Scale" indicates that the model is a miniaturized version of an actual object, like an automobile, made to a specific fraction of the real thing. Scales typically range from 1:24 to 1:100; a 1:24-scale model is 1/24th of the size of the real object. Common scales are 1/24, 1/48, 1/72, and 1/100. Many of the same engineering skills go into producing scale models as into the real machines represented. Model kits are made in approximately five skill levels. Snap-together models provide all the pieces with tiny tabs that fit in specially shaped holes. The plastic pieces are made in the same colors as the original; and virtually no tools, adhesives, paint, or other equipment are needed to build them. The plastic parts simply snap together in a sequence depicted on an instruction sheet; these models are an excellent introduction to the kinds of pieces in a model kit and prepare a novice builder for the next step. The next three levels are beginner, intermediate, and advanced. The level is described on the box containing the kit, and, as the names suggest, the kits become increasingly complicated with more steps in assembling and detailing the models. 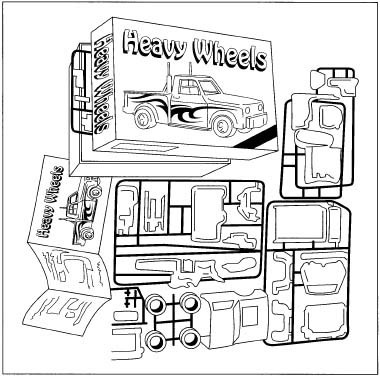 The most advanced kits are called customized kits and provide the model builder with a variety of styles of engines, bumpers, hubcaps, and other details of an automobile (for example), as well as options for making a truly unique model suiting the builder's imagination. Model-making is as old as civilization. Scale models of buildings, boats, and furniture were buried in tombs of ancient Egyptians to represent possessions the dead took into the next world. Many ancient models survived in the tombs while the original objects did not; these have given historians an understanding of what life in ancient civilizations was like. During the Napoleonic Wars (1799-1815), French prisoners of war carved beautiful model warships from wood scraps; these models are so detailed that they have become documents of warfare and ships lost at sea. They are also highly prized today among antique collectors. During the Industrial Revolution of the eighteenth and nineteenth centuries, inventors of new tools, machines, artworks, and other objects began by building models of their ideas. Industrial technology was found to have its own beauty, and large machines like locomotives were admired and copied in miniature. Early in the twentieth century model ships and airplanes were sold in kits. Balsa wood pieces were machine-cut to fit together easily and could be painted and rigged like the originals, although they were fragile. In the 1920s, some firms produced scale models of their products out of metal and wood as promotional models. Citroen, the French car manufacturer, produced delightful models that are now valued collectibles. World War II moved modeling into a full-scale industry and hobby for two reasons. First, plastics were invented and perfected during the years before and during the war. Their versatility made them ideal for mass-produced model kits. Second, the machines of the war stimulated the public's interest in modeling. Slim fighters and heavy bombers intrigued many hobbyists who saw the real aircraft flying overhead on the way to war. The exploits of navy ships, both small and large, in the Pacific also fired imaginations. When soldiers and sailors returned home, they had more time and money for recreation, including building models of the machines they knew so well. Monogram Models introduced its first kits of warships in 1945. The returning war veterans were also able to afford the automobiles that rolled off Detroit assembly lines; they also built models of the cars they owned—and the ones the dreamed of. In 1951, Revell introduced its first all-plastic model kit of an early automobile: a classic 1910 Maxwell, in which the driver was a scaled-down version of radio comedian Jack Benny. By the mid-1950s, more detailed kits and models that could be customized appeared. By the 1960s scale modeling was a full-fledged hobby with thousands of models covering hundreds of subjects. By 2000, the scale-model industry had produced more automobiles than all the automotive giants of Detroit combined. In the 1960s, the scale-model industry expanded into ancient history and science fiction. Models of dinosaurs that once roamed the earth, monsters like Godzilla, superheroes like Superman, television characters like the Lone Ranger, and celebrities like Elvis Presley were mass-produced in scale form. The scale-model manufacturers also provided outlets for the public's interest in the Space Race during the 1960s, and models of the newest spacecraft were often on the hobby store shelves before the real-life vessel had taken flight. Fantasy followed here, too, with models of starships and intergalactic craft that have flown on television and in the movies. As techniques for precision casting of true-color parts continued to improve, scale models became important teaching tools. Detailed anatomical figures that can be snapped apart and reassembled are members of many classrooms, as just one example. Plastic is the essential raw material for the majority of scale models made today. The plastic used to mold the parts is purchased in bulk quantities by the manufacturer. These pellets are purchased in common colors, but additional pigments can be added to the plastic while it is being melted. Printed items, including decals, the instruction sheet, and the box are also important parts of model kit. The box front usually bears a full-color photo or an artist's detailed depiction of the completed model, or a photo of the original object (like an automobile). Designs, layouts, photos, and artwork are prepared by artists in the model-maker's design studio; they are printed by specialized printers. Paints and glue for assembling and detailing the model are not part of the kits. These are manufactured and sold separately because they have shorter shelf-lives, might leak inside the box, and could damage model parts as they move. Major model manufacturers produce or market their own brands of paint, glue, and assembly tools. Other raw materials for models include balsa wood. Before the development of plastics, this was the prime material for model building, and it was sold in lengths and widths like small boards. Sometimes the balsa wood had outlines stamped on it that the builder could follow when cutting out pieces; other times an appropriate assortment of wood was packaged together with a set of patterns and instructions printed on paper for the model builder to follow. More often, the model builder used imagination and skill to scale, cut, assemble, and detail wood models. Balsa wood is still sold for model building, but it is far outclassed in volume by the plastic model industry. From inception to production, creating a new scale model kit can take a full year and cost the manufacturer an investment of up to $250,000. For the scale model of a classic automobile, for example, the design process begins with pure research: taking hundreds of photographs of a working example of the car. The car is photographed inside and out; pictures are taken of every detail and from many angles, and measurements are photographed along with the object for the designer to use in the studio to reproduce the car exactly. For a new car design, car manufacturers give model makers computerized information on part specifications—sometimes even before the first actual automobile has been assembled—in a highly confidential process. The model designer uses computer-aided drafting and design (CADD) software to sort this information and create the measurements and configuration that will be used to make a scale design. The designer transfers this information to a set of drawings that will be used to make the molds for the model. This process can consume several hundred hours of engineering time. From photographs, computer data, and paper drawings, the design moves to pattern-making phase. Skilled artists follow the designer's drawings and carve out a pattern model from balsa or other soft wood. The pattern model is made at two to three times larger than the scale of the model kit, allowing additional details to be added to the pattern. This also proves the accuracy of design and provides a basis for all of the molds that will be made of the car parts. As they carve the pieces, the pattern makers fit them together. Accuracy in pattern-making is within several ten-thousandths of an inch (fractions of a millimeter). When the wooden pattern model is complete, each part is coated with an epoxy resin, a plastic material that hardens as it cures. The wooden piece is removed from the resin, and the resin has trapped the shape of the piece in a cavity mold. A core mold of resin is made from the cavity mold; the two fit closely together, but there is a small space between them. The plastic model part will be formed in this space. Preparation of the wooden pattern and the resin molds takes over 1,000 hours. Meanwhile, other design engineers use the design drawings to lay out the "tool," the metal cast of a number of parts that will be molded on a single form of plastic called a tree. The tree is usually roughly rectangular along its outer edge so it will fit in a box. Several standard box sizes are used. From the central "trunk" of the tree, a number of plastic "branches" or arms protrude. The end of each branch narrows to a node where it joins a piece of the model. The model piece can be snapped off for assembly. The tool designers also use CAD to map out the tool layout. They must design the orientation of each model piece on the tree to precise angles so that, when the plastic is injected in the tool, it fills all the cavities. The trees are also designed to release quickly from the mold. The resin molds are used to make the individual tools for each of the model parts, using a pantograph to copy the exact shape of each piece and draw it at the smaller scale of the actual model. The pantograph has two needle-like parts: one is run over the surface of the resin mold while the second, a cutting blade, carves the steel to the same shape at the correct scale. When the tool maker has completed the scaled tool, he polishes it to a high sheen and adds more details by hand. Some of these details are too fine to be seen by the naked eye. Another set of designers works on the paper portions of the kit. To develop the instructions, the designers take the pattern model (and sometimes samples of the first production run of the plastic model) apart and reassemble it. They describe the steps as they go, writing and drawing them as instructions. Other artists look at the photographs of the real automobile and design decals for the model. These may be copies of real decals on the car, or they may be other design features like racing stripes. Sometimes, more research is needed to capture these details. The illustrations on the box lid are also created. These serve the model builder as a color reference guide, so they must be true to both the original automobile and the decals made for the model. The illustrations on the lid may be photographs of the real car or artists' impressions. The box lid for a model of a Fokker triplane, for example, may show the Red Baron's famous airplane in a dog-fight. Elsewhere on the lid, the artists describe the kit, its level of difficulty, the parts enclosed, and the manufacturer's details. An example of a toy model kit. with a hoist into the cavity of the injection molding machine. In a separate part of the injection-molding machine, the fine, confetti-like pellets of plastic are poured into a storage hopper above the machine. When molding is about to begin, the pellets are fed into a heating chamber where they are melted at a temperature of 500° F (260° C). The liquid plastic is pumped into the cavity of the injection molding machine where the tool is contained. The pressurized liquid plastic is injected into the tool at a pressure of 1,000 lbs per square in (58 kg per square cm). Aided by the careful layout within the tool, the combination of high pressure and high heat forces the liquid plastic into every crevice of the tool. In several seconds, the tree forms, the plastic cools, and the tool opens slightly allowing the plastic tree to fall out onto a conveyor belt. The injection machine closes the tool again, and more plastic is injected for the next tree of parts. The trees are injection-molded at a rate of about two trees per minute. Any gaps around the edges of each tree will also fill with plastic. These appear on the trees as paper-thin excess and are called flash. When the model builder begins making a model, the flash must be trimmed off. At another machine, the clear plastic parts like the automobile windshields, are molded. Rubber tires are produced by a third machine, and other specially colored parts may be produced by yet another machine in the plant. Chrome parts, like the radiator grille, are first injection-molded then placed on the conveyor where they move to a dipping machine that picks individual trees off the conveyor and dips them in a metallic coating. The dip dries quickly, the machine redeposits the chrome-colored trees on the conveyor, and they move toward the package assembly area. At the package assembly area, assembly-line workers sit along one side of a conveyor belt that feeds box bottoms to them. They select one of each of the trees of model parts from a series of bins behind them, slip the trees into plastic bags, add sheets of decals and folded instructions, close the bag, and put it in the bottom of the box. The bottoms travel along the conveyor to a machine that caps them with lids and seals the box ends or covers the boxes with shrink wrap. Boxes are multipacked in cartons and taken to the shipping department. Making scale models is design intensive, with much of the process taking place in the design studio rather than the factory. Designers are extremely knowledgeable about their subjects, whether warships or cartoon heroes, and are highly attentive to the details in their designs. Designers can reject work at any point in the process. A review board approves the initial design concept, the design drawings, pattern and tool making, and samples from the first production run of the plastic model. In the factory, quality-control personnel observe the injection molding and dipping processes. Quality-control personnel observe the assembly line, and when kits have been assembled, sample boxes are pulled from the line and checked to confirm that all parts are present. Toy model manufacturers are able to recycle much of the waste associated with manufacturing plastic models. Plastic waste can be melted and remixed in future batches. Steel from tool making is collected and sent to a metal recycler. Paper products are made from recycled paper. Safety for factory workers is particularly important for the pattern and tool makers and personnel that control the injection-molding process. Pattern and tool makers wear gloves and safety glasses as they carve out patterns, make resin molds, and etch steel tools with the pantograph. The area where resin molds are made is equipped with ventilation hoods. Operators of the injection-molding machines wear heavy gloves to protect them from the heat generated by the machines. The machines themselves are fully automated and require observation only. The health of the toy model kit industry has a number of positive indicators. In the 1990s, modeling giants Revell and Monogram merged, and, as of 2000, made 10 million kits a year. Model-making clubs like the International Plastic Modelers' Association have branches in many cities, in large businesses, and on the Internet. Fairs and other displays often have model-building contests as well as exhibitions of models and dioramas; these include not only "scratch-built" models (the highest level in which the hobbyist makes all the parts and details by hand to complete a model) but manufactured kits from snap-together through customized models. The fascination of the toy model kit has several elements. It is a construction hobby that requires handwork and skill to shape a collection of small pieces into a completed work of art. The investment required can begin with only pocket money for a few tools, finishes, and a kit. Toy model kits are outstanding teaching tools. Research has gone into their design, and students can learn from personal research about the actual object such as when the automobile was manufactured, which airlines fly particular plane designs, and how a comic strip artist created his character. With tie physical parts provided in the model kit, the model builder can use patience, thought, handwork, and imagination to transform history, science, and popular culture into three-dimensional models of objects that were or that may be in the future. Bowen, John, ed. Scale Model Sailing Ships. New York: Mayflower Books, Inc., 1978. Ellis, Chris. How to Make Model Aircraft. New York: Arco Publishing Company, Inc., 1974. Ellis, Chris. The Scale Modeler's Handbook. Secaucus, NJ: Chartwell Books, Inc., 1979. Gordon, Theron L. How to Build, Customize & Design Plastic Models. Blue Ridge Summit, PA: TAB Books, Inc., 1982. Harris, Jack C. Plastic Model Kits. New York: Crestwood House, Macmillan Publishing Company, 1993. Marmo, Richard. Building Plastic Model Aircraft. Blue Ridge Summit, PA: TAB Books, Inc., 1990. Price, Brick. The Model Shipbuilding Handbook. Radnor, PA: Chilton Book Company, 1983. Testor Corporation. http://www.testors.com (January 2001). A very interesting article with a very nice summary of the process. I note one minor error in the section entitled ' The Future' - the sentence "Model-making clubs like the International Plastic Modelers' Association have branches in many cities, in large businesses, and on the Internet." should read "Model-making clubs like the International Plastic Modelers' Society (IPMS) have branches in many cities, in large businesses, and on the Internet."